During a holiday you can take a break from your mundane lives, let your thoughts roam wild and concentrate on the sunny side of life. 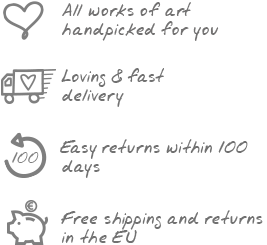 This positive effect can be achieved through artworks from KunstLoft too. We hope and we believe that our paintings as well as sculptures can change the atmosphere in a room such that you and your guests will feel rested and uplifted. You should always create a retreat for yourself, which you decorate with atmospheric and stylish motifs. When designing and decorating the interior of your holiday home or hotel, it is important to make sure that your guests feel welcomed in this place. This can be achieved through handmade canvas paintings about holiday. For many people, Italy is the holiday destination: this boot-shaped peninsula awaits her visitors with delicious food, splendid weather and white sandy beaches. If you have been charmed by the country on your last holiday, why don’t you take a piece of it home by placing an acrylic painting of Italy in your living room? As you set your eyes on such a painting, you will not only re-live the happiest moments, but perhaps also be inspired to plan another holiday to Italy or prepare an Italian meal for your loved ones under the motto ‘La Dolce Vita’! Some people however prefer resting at home rather than travelling when they have holidays. Handmade paintings with holiday motifs work charms in your living room and they might even prompt you to some culinary adventures in the kitchen. Combine these with a chili sculpture for a playful and well thought out decoration theme. Alternatively we recommend maritime-themed acrylic paintings for your bedroom, which have a calming effect and from which you can feel the love for detail in every single brushstroke. At KunstLoft you can find high quality art at affordable prices, since we are convinced that everyone’s life should be enriched by art. You can bring feelings of relaxation into your living room or office with paintings full of holiday motifs. Handmade acrylic paintings allow you to dwell on memories of dreamlike landscapes, white beaches and the crystal clear sea. You'll find yourself planning your next summer holiday with this artistic inspiration.